Yo! I’m pawtying here in the Colorado mountains where a hot dawg like me can chill out and have fun on this very big occasion. It’s my SEVENTH ampuversary! There’s so much to do, like swimming and hiking. Every German Shepherd Trpawd needs a job. Oh and being in the Fourth of July parade too! My peeps work at the ranch all summer. When they’re gone, I patrol for skwirels and keep an eye on all these loose, unregulated Shelties that run around. That’s not the life for me, I’d rather watch from the comfort of my doghouse on wheels. On hot days (which is like 80 here!) they take me swimming in the ponds. Maybe today we’ll go, after all, it’s a special day! Yes, three-legged dogs can swim! Today, I’m seven and life is good. 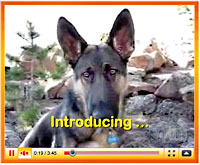 I’m a little mellower but rock solid and I love my job as Tripawds Spokesdawg. Who knew when I was chained up in those mean people’s yard that I would go on to worldwide fame? Yep, that’s meeeee. The one n only Wyatt Ray Dawg. Wyatt, you are one beautiful dawg!! Congrats on your ampuversary. Congratulations beautiful Wyatt Ray! You are looking magnificent as ever! You sure are livin’ the good life and are an awesome “spokesdawg”. Bet a juicy steak is on tonight’s menu in true celebration! Congratulations! And your pictures really make me miss Colorado! Congrats! Skwirels and ponds…I think you found German Shepherd heaven on earth! You are one kucky dawg! ‘You get to do THE most fun things as a Regulator and as our famous Spokesdawg! You get to play and regulate in THE most scenic areas nature has to offer! And when you are there, you make the scenes even more beautiful! WOW… you do live the good life Wyatt! I love hearing about your adventures on the ranch! You are a handsome fella and so happy you found your fur-ever home with your amazing family! Cheers to another mega milestone and many, many more!!! Wyatt Ray Dawg – parade star! Happy Ampuversary!! Yo! Wyatt Ray Dawg! Lookit you all grown up. Happy Hippy Hoppy Numbah 7 dude! Seems like only yesterday you were struggling to keep up with me 3 weeks after your amp surgery. And now you are an amazingly good lookin’ tripawd warrior. Geez, who woulda thunk it. You are even getting a frosty face! Make sure you keep all those dang Shelties under control! Lemme know if you need help, we’re only a roadtrip away and the Oaktown Pack has your back l’il buddy, now and forever. Awwwww you guys are the best, thank you for making my ampuversary the best EVER. Next year you are all coming to Colorado for my big pawty at Jerry’s Acres OK? I am so sorry I missed your big milestone my handsome husdawg! Congratulations on your 7 years on 3! yay…Way to go – you all give me hope that I am going to live long and prosper on 3! =) I want to be at the ranch next year to celebrate with you! 80 degrees sounds fantastic in July! Oh my silly wife! I know you have so much on your mind when it comes to regulating that pack of yours. No worries my dear, we shall meet again next year! Well CR, I learned from the best. Paw shucks Pofi, you need to join me next time. Nuthin like two pointy-eared dawgs leading the parade! Yes yes! Jasper can join the pawrade with us! I cannot wait! Awww Sally. I try to live up to Jerry’s leg-a-cy. Thank you for all the love. Come visit us with the pack Christine! We’re waiting! Michelle I want to show you around. Will you come visit? Linda, I agree, a juicy stake is the best way to pawty! Thank you Paula! Come pawty with us. Me n Nitro would make a good pair whooping it up, don’t you think? Happy ampuversary, Wyatt! Enjoy the great outdoors!